Dicker Data has told shareholders it is expecting to see flat revenue growth in its New Zealand business during the second half of the year, after its distribution partnership with Cisco came to an end earlier this year. The Australian Securities Exchange (ASX)-listed distributor, which released its half-yearly financials for the six months ending June on 28 August, announced on 15 August 2017 that it would cease to distribute Cisco products in New Zealand later this year. “We are expecting New Zealand revenue for H217 to remain flat,” the company told shareholders. However, Dicker Data said it remains hopeful that, despite the Cisco decision, one of its key initiatives in New Zealand for the second half – to target growth in its software and volume portfolios with focus on the mid-market and small to medium-sized business (SMB) market – will help to bolster its performance in the market. Additionally, the company will be focusing on restructuring the Kiwi business so that the cost structure is “appropriate” to the adjusted level of expected revenue from its remaining vendors in the country - it will also focus on potential new vendor targets. The distributor also stressed that the Cisco departure in New Zealand does not impact its distribution agreement with Cisco in Australia. “Over the course of the next few months we will be selling down Cisco inventories and working with Cisco to transition our partners,” a company statement read. “Whilst we disagree with Cisco’s decision, given Dicker Data’s strong expertise and partner relationships in the enterprise and mid-market communities we will be actively looking to form new tier-one vendor relationships in New Zealand. “We remain committed to the New Zealand market, but to ensure the viability of the business we will be restructuring so that the cost structure is appropriate to the adjusted level of expected revenue from the remaining vendors, whilst aggressively looking to fill the revenue void with potential new vendor targets." Read more What’s next for Chris Price after Ingram Micro departure? At a country level, Dicker Data’s Kiwi business grew in revenue by just over three per cent year-on-year, to $1.9 million during the six months ending June. Meanwhile in Australia, the company's revenue saw a 7.7 per cent year-on-year surge for the half year, to $40.8 million. Overall, the six months to June 2017 saw the company’s revenue grow at a rate of 7.1 per cent, largely through growth in both established vendors and new vendors. During the course of the 2016 financial year, and for the year to date for the 2017 financial year, Dicker Data on-boarded nine new vendors. Across the board, Dicker Data reported revenues of $632.5 million for the six months to 30 June, up by $42.1 million, or 7.1 per cent on the previous corresponding period. Total gross profit for the company was $57.1 million, an increase of $3.6m, or 6.8 per cent, over the same period the year prior. Meanwhile, Dicker Data’s profit margins have remained stable in the current period at nine per cent - net profit after tax (NPAT) for the period increased by 3.3 per cent, year-on-year, to $13 million. 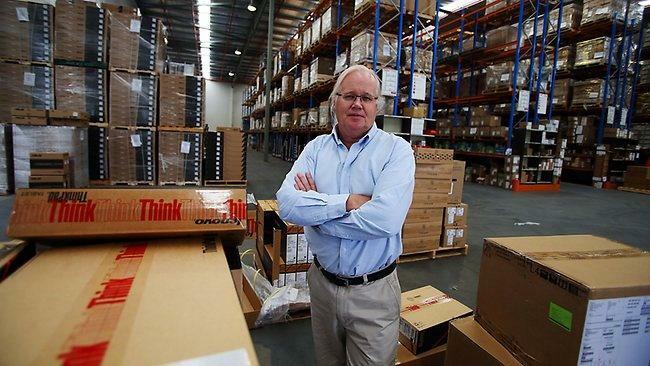 At a sector level, Dicker Data saw continued growth in hardware, which grew by four per cent, to $19 million, while software surged by 21.1 per cent to $23 million for the half year. At the same time, services grew by 25.5 per cent, to $700,000 for the period. However, operating expenses for the company increased by 6.8 per cent, to $2.1 million during the six month period, while a headcount increase from 371 to 404 saw salary-related expenses accounted for increases in costs. The headcount increased with investment in growth portfolios as a result of new vendor additions, the company said. Dicker Data also revealed that it is making progress on preparing its development application for its new Sydney distribution centre in Kurnell. “We expect to lodge a development application by the end of this year,” the company said. “As such we do not expect to incur any material capital expenditure until early next year. “In the meantime, we are near completion of the demolition and clearing of the site in preparation for the construction next year,” it said. Looking forward, Dicker Data suggested that hybrid IT will continue to dominate consumption and affect the way its partners consume technology. Subsequently, its focus going forward will dwell heavily on cloud, the internet of things (IoT), big data management and hyper-converged infrastructure, among other areas. “Our partners need help in navigating an increasingly complex market and Dicker Data’s expertise as a trusted advisor will become increasingly critical and demanding,” a company statement read. “Recurring revenue streams with software-as-a-service (SaaS) and infrastructure-as-a-service (IaaS) will continue to be a focus. "Technical expertise and specialisation in areas such as cloud computing, IoT, big data management and data centre and hyper-converged infrastructures will become even more critical in order to provide true value added services to our partners. Dicker Data will continue to invest in deep technical expertise in these areas in H217 and in FY18."